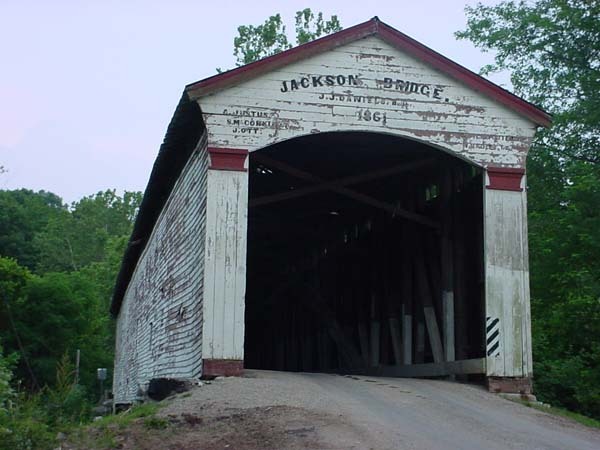 This page contains pictures of the Jackson Covered Bridge from June 2006 to January 2007. 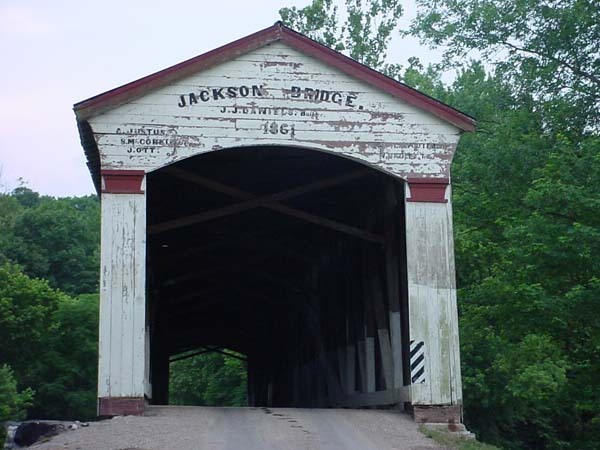 Use the quick links to see pictures from a specific month. 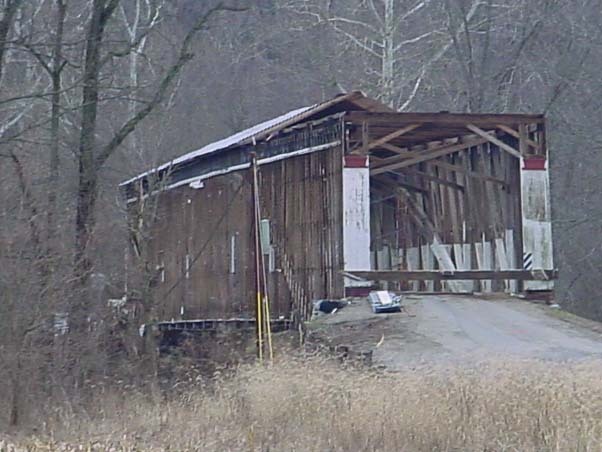 These pictures were taken in June 2006. 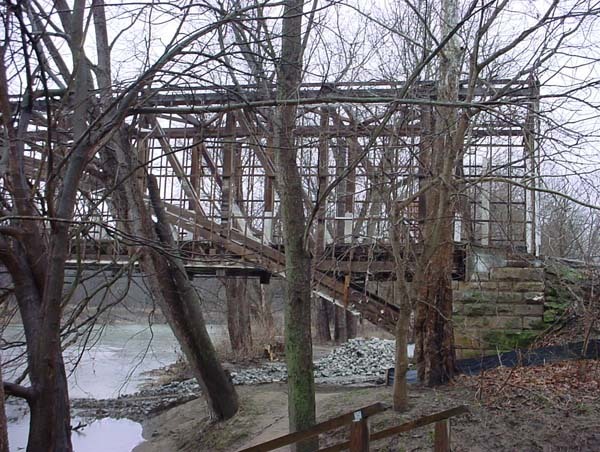 They show the condition of the bridge before the rehabilitation began. 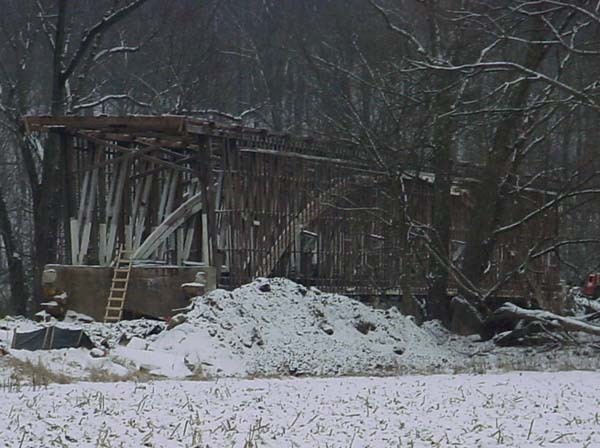 December 26th The siding has been removed from the Jackson Covered Bridge and work has started on the removal of the roof. 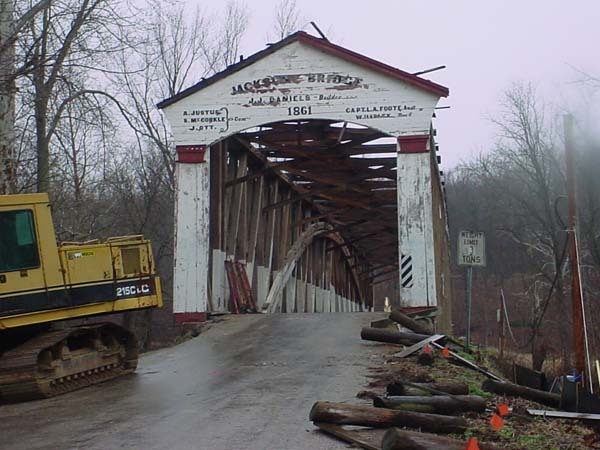 January 4th The roof has been removed from the Jackson bridge. 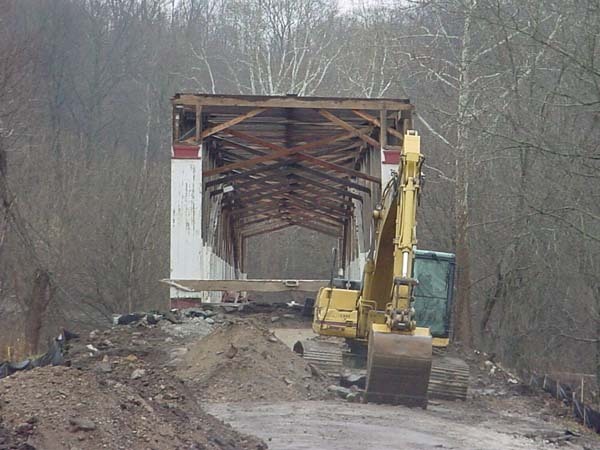 Equipment has been brought in to work on the approaches in preparation for moving the bridge. 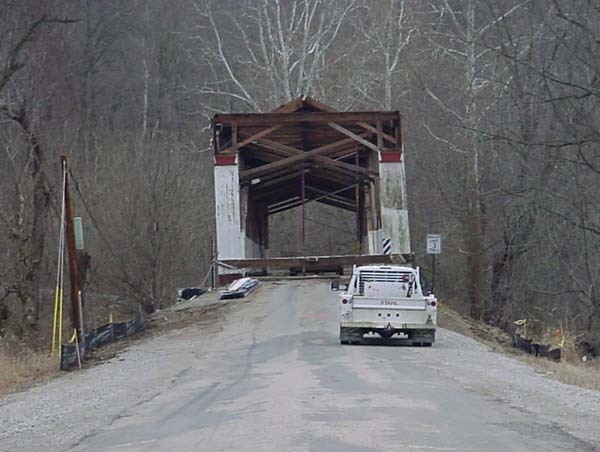 These pictures were taken from the north side of the bridge. 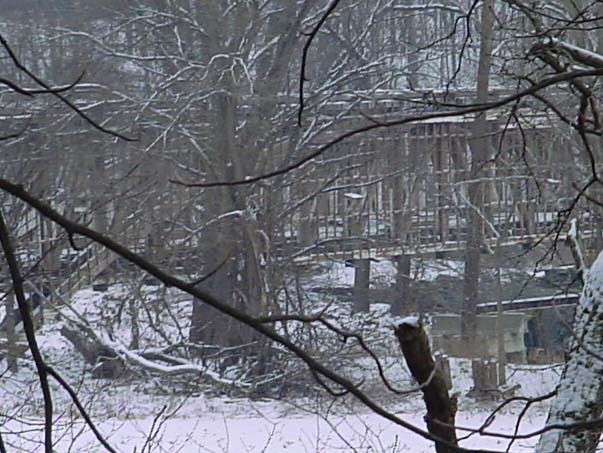 January 4th These pictures were taken from the south side of the bridge. 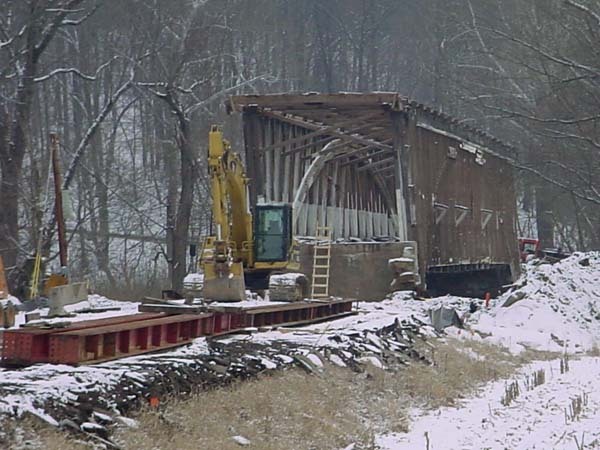 January 12th Work continues on the bridge getting it ready to move. The approach work is nearly done. 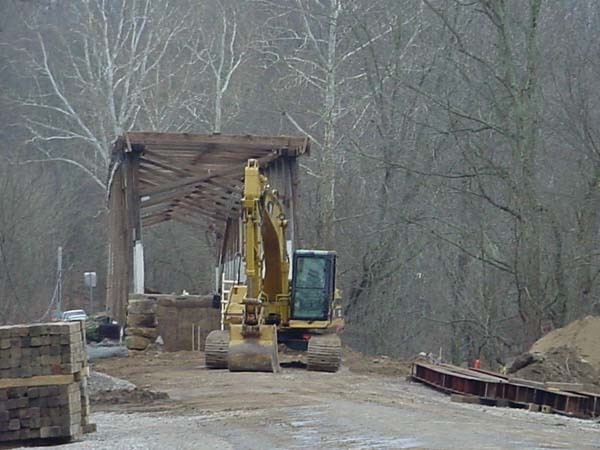 The contractors are building a support system in the creek so the bridge can be slid off. 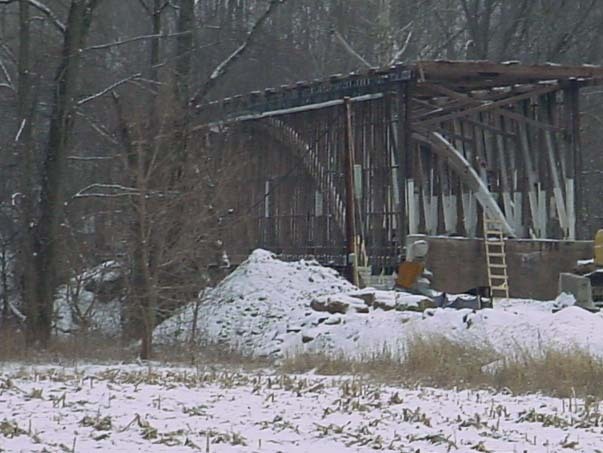 The work has been delayed because of weather. 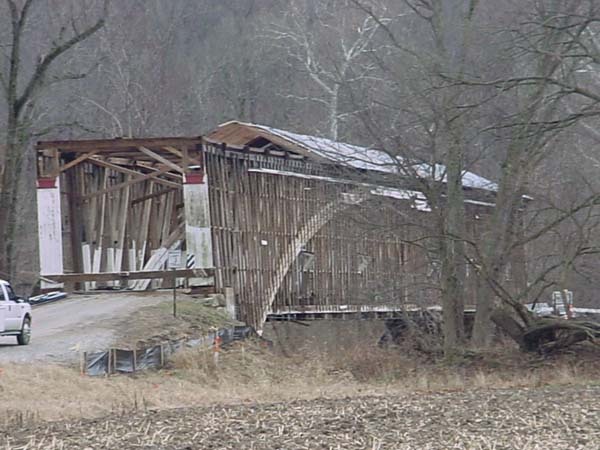 Parke County is having a very warm and wet winter. 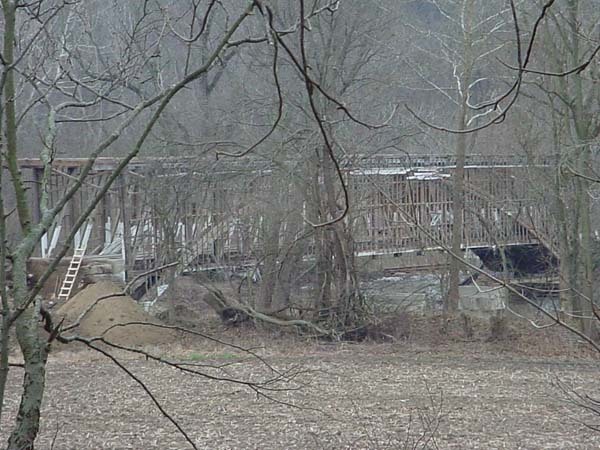 These pictures were taken from the north side of the bridge. 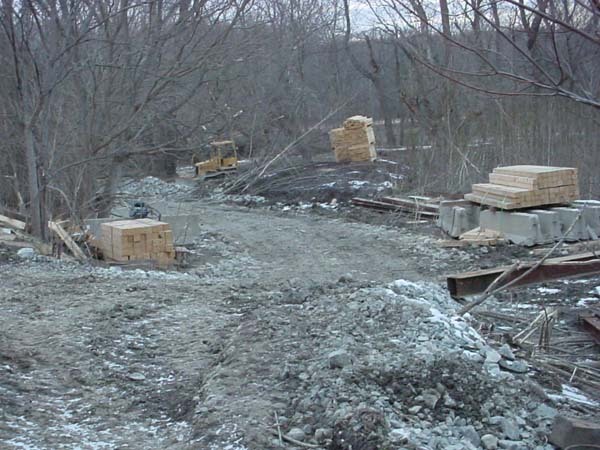 January 12th These long range shots show the construction work that is being done in the creek. 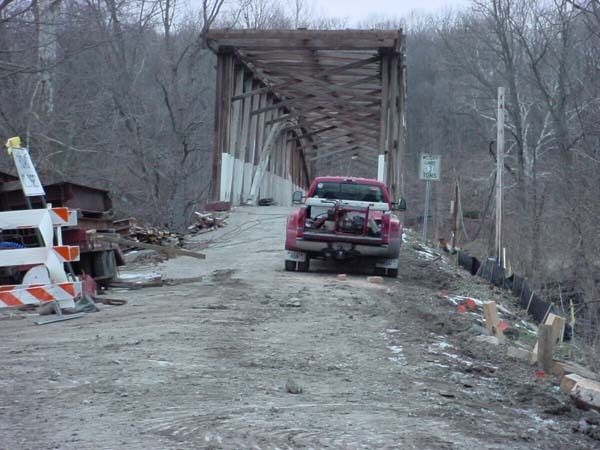 These supports must be completed before the bridge can be rolled off the abutments. 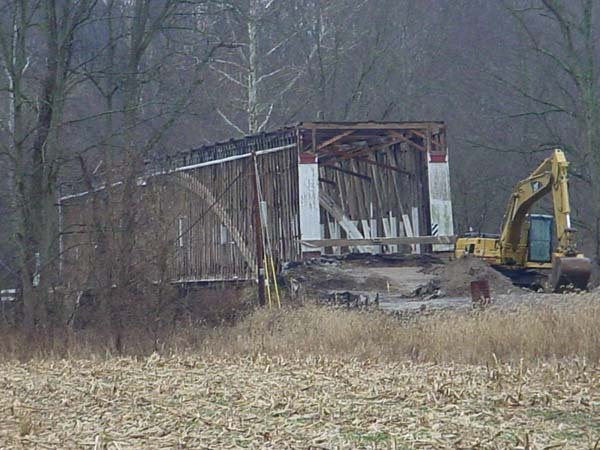 January 24th The work on the bridge has been slowed because of the rain that was received. 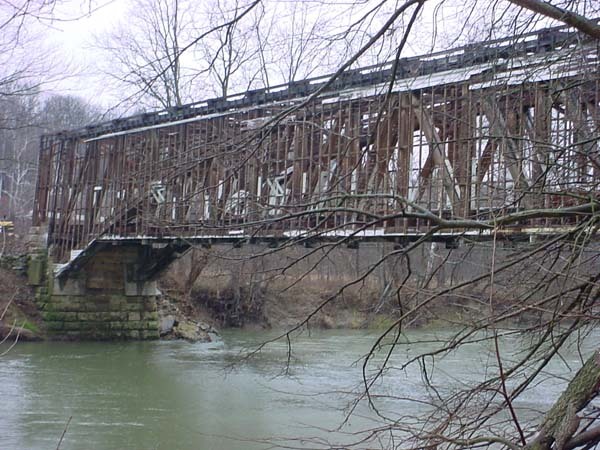 The water level in Sugar Creek is back to normal and work on the supports is underway. 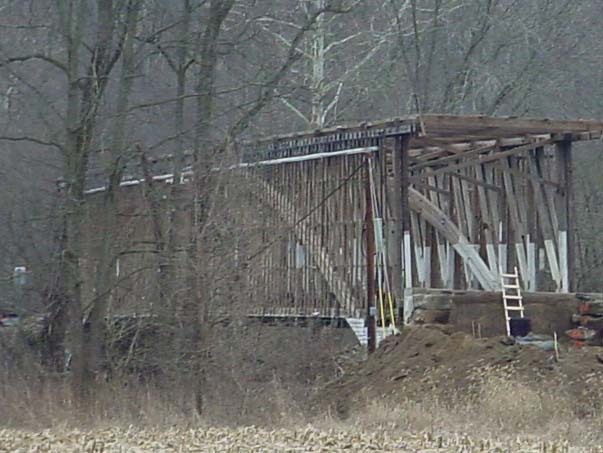 These pictures were taken from the north side of the bridge. 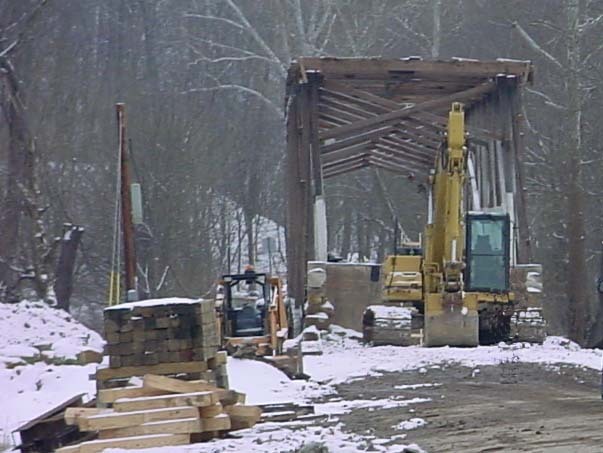 January 29th The workers have been able to build the support bridge under the Jackson Covered Bridge. 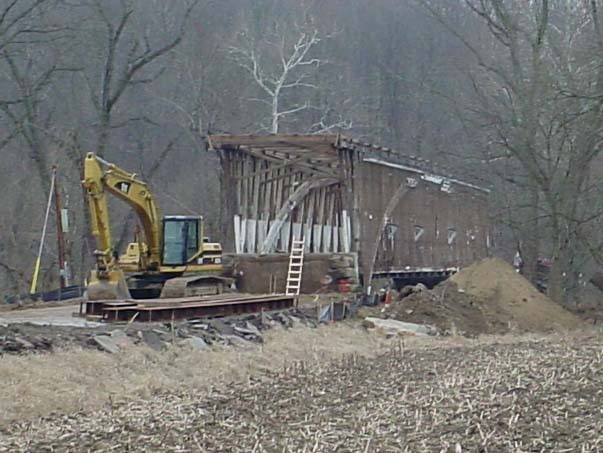 The covered bridge is being placed on dollies that will roll on the support bridge. 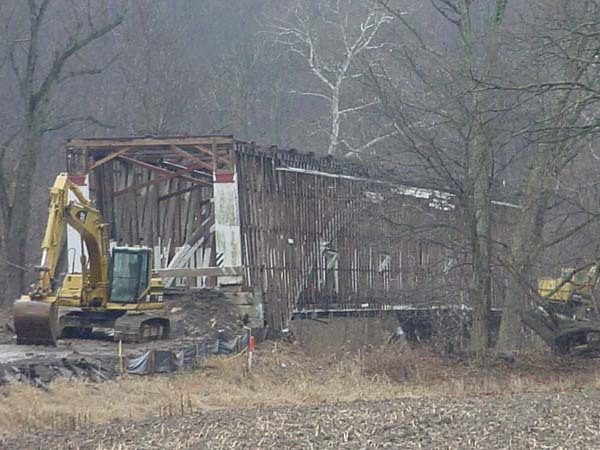 The bridge is only days away from being moved off of the foundation. 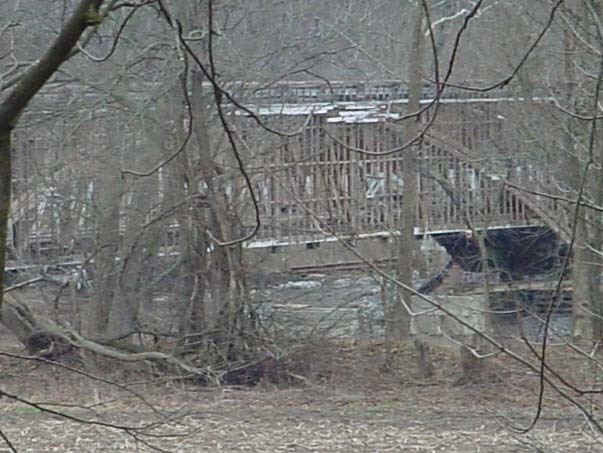 These pictures were taken from the south side of the bridge.